Hey everyone!! Today is the first Caardvarks Challenge that I designed for. 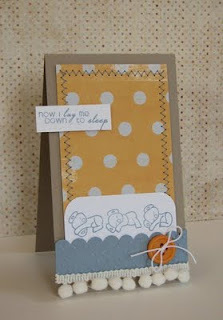 We received some fabulous stamps from Clear & Simple Stamps and I received the Naptime stamp set. Now I do have to say that I was a little skeptical about stamping with acrylic stamps because I am a huge rubber stamp fan and I haven't had much success getting clean images with most acrylic stamps, but I am warming to the idea of using clear acrylic stamps if they are all like this set that I received from Clear & Simple. The images stamped perfectly with my Stampin' Up! inks. Hurry on over to Caardvarks to check out the "Circle of Friends" circle card challenge. 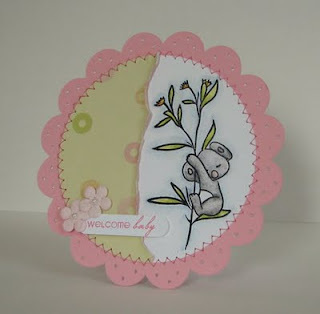 Here are my cards....the first one is a circle for a baby girl and the second one is a tall card for a baby boy. So cute!! Cardstock, ink, scallop edge punch: Stampin' Up! Please leave a comment and have a fabulous day!! Amy, congrats on the Caardvarks DT!!! You did an awesome job with the circle challenge this week and I love what you've created with the Clear & Simple Stamps! Ummm hello - this is adorable! Correction ABSOLUTELY ADORABLE!!!! Congrats on the DT spot, your work is fantastic!